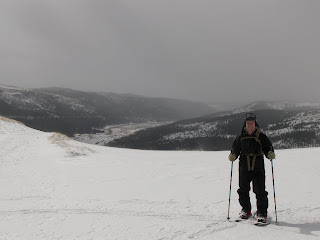 I recruited Nick to go along with me on a Colorado Snow Climb of North Star Mountain's East Ridge. This climb starts at the parking lot at the top of Hoosier Pass on Colorado Highway 9. There is a nice sledding hill just up from the parking lot. We started out on the jeep road that circumscribes the first hill. I understand that part of this road might be private property, but it didn't appear that the mine owners are too interested in keeping people out. They are mostly concerned with people getting hurt on their property. I promise not to sue. There was one part of the road where the snow was particularly steep. Moving over this snow perpendicular to the slope was a delicate affair. Once you reach the first saddle the mass of North Star confronts you. 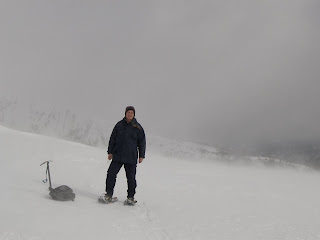 It is a fun slog up the slope on a huge snowfield. By the time Nick and I made it to the long ridge, we were quite tired. The weather was turning very windy and cold, so we decided to eat lunch and turn around. 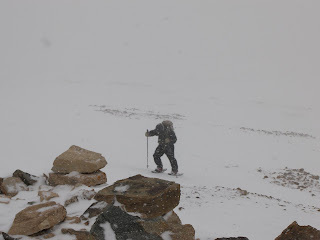 On the return we encountered a few ski-mountaineers skinning up the mountain. It would have been fun to have my snowboard, but instead just snowshoed down. Nick did not use a balaclava so his face was quite wind-burned upon arrival back at the truck. I must return to North Star Mountain again. I would feel safe climbing this mountain alone and the avalanche danger appears low.